Lighting Global, the World Bank Group’s platform for developing the off-grid market to help people with no access to electricity, has partnered with the United Nations Foundation to organize a webinar on the international quality assurance framework for off-grid solar lighting products, and its application to bulk procurement of solar lighting devices for use in humanitarian contexts. Several humanitarian organizations have been invited to attend, as well as members of the United Nations Sustainable Energy for All (SE4All) network and the Safe Access to Fuel and Energy (SAFE) humanitarian coalition. 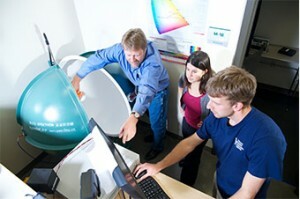 Dr Arne Jacobson (L) and members of the Lighting Global quality assurance team test a lighting product at the Schatz Energy Research Centre, Arcata, California © Lighting Global. The webinar titled “Solar Lighting in Humanitarian Settings” is scheduled for 19 February from 10:30 AM to 12:30 PM (US) Eastern Central Time. To register, send an email to mganeshan@unfoundation.org. Dr.Arne Jacobson, who leads the Lighting Global quality assurance work, will present Lighting Global’s work in developing and managing the quality standards for the off-grid lighting market at the event. This will be followed by reaction from the United Nations High Commission on Refugees. “Tremendous work has been put into understanding barriers to energy access among off-grid, low-income communities, and we find that many buyers choose not to invest in modern energy solutions because they are concerned that products will fail prematurely or will not perform as advertised. As a result of these concerns, many people continue to use dangerous, expensive and unsustainable fuels such as kerosene,” says Dr. Jacobson. The quality standards for off-grid solar lighting products were develope dby the IFC-World Bank Lighting Africa program, an affiliate program of Lighting Global and, after refinement through international stakeholder consultations, were adopted by the International Electrotechnical Commission (IEC) in 2013 as the global standard for off-grid lighting products. UNHCR launched a global energy access strategy last May aimed at increasing energy access to refugees in 10 priority countries – Bangladesh, Burkina Faso, Chad, Ethiopia, Jordan, Kenya, Nepal, Rwanda, Sudan and Uganda. In the first two years, the strategy will provide some 175,000 refugees with stoves and another 150,000 with solar-powered lanterns. In addition, 2,000 solar-powered street lights will be installed in households and communal areas. “Safe access to domestic fuel and energy stands at the intersection of so many things that are of concern to UNHCR – from protection, to nutrition, to health, to the environment, to livelihoods to education,” Steven Corliss, director of the UNHCR Division of Programme Support and Management, said at the launch of the SAFE strategy in Geneva.